For a renovation that was scheduled to last 3 months, we are now approaching the 6 month mark. Yikes! What can I say we have lives and jobs and sometimes things don’t go exactly as planned. That being said. I have an update to share! We have been moving quite quickly during these last few steps and I can finally see light at the end of the renovation tunnel. 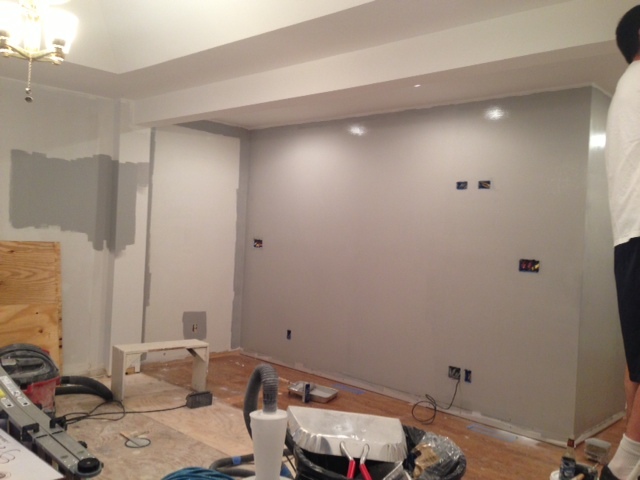 Back in April we finished up with the drywall and had started mudding. 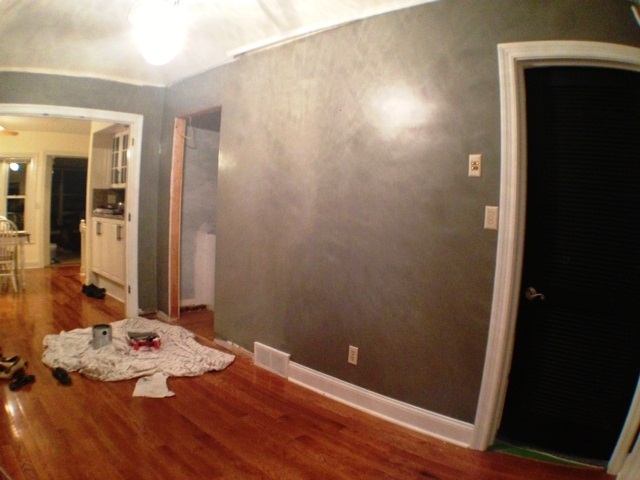 As of now, we are completely sanded, primed, and dare I say it, PAINTED!! I forgot to take pictures on the Nikon but luckily I take tons of shots on my iPhone that we periodically send to family. 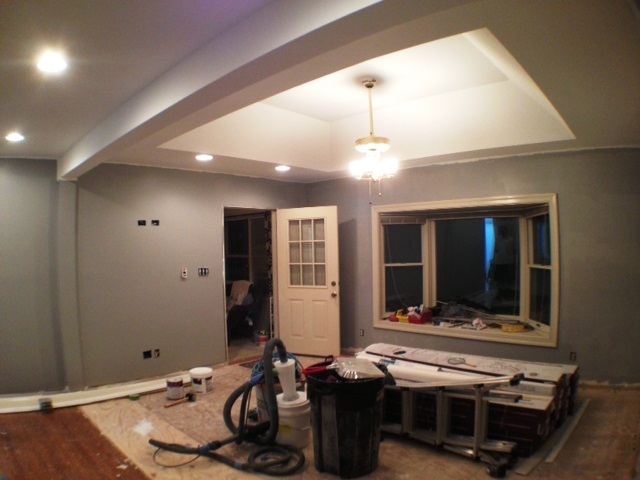 The biggest decision in painting the master bedroom was h0w to paint around the load bearing beam we installed. 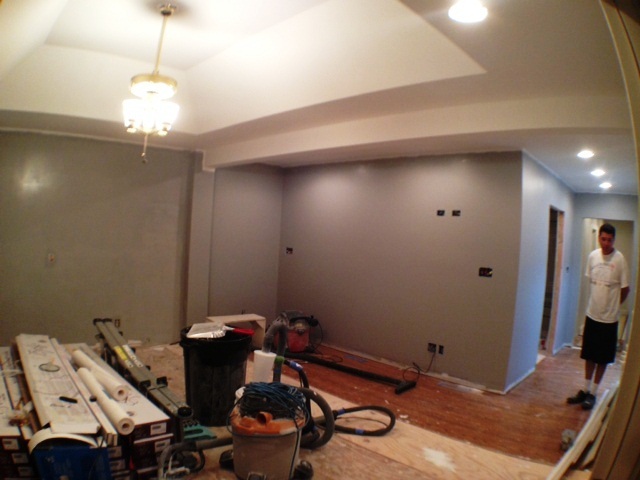 We decided to paint it white so that it could (hopefully) blend in with the ceiling. I grey I chose (on a whim when I was at The Home Depot) is slightly darker than what I had hoped for so she’ll most likely get another paint job in a lighter shade. 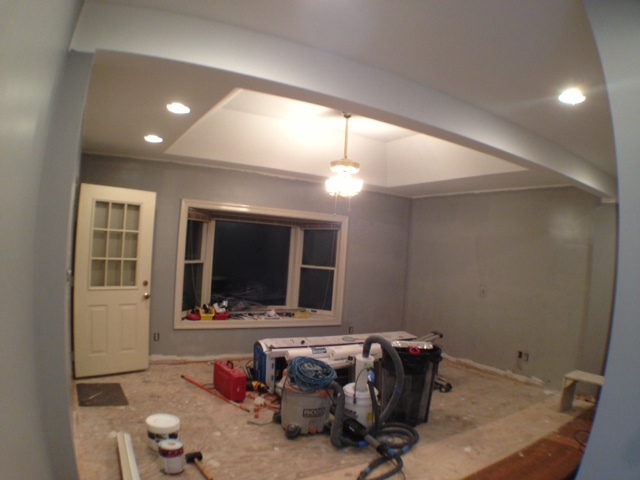 One of the biggest accomplishments (in my mind) was getting the foyer area mudded, sanded, primed, and painted….and plastic removed. This area took a very long time because we kept forgetting about it. 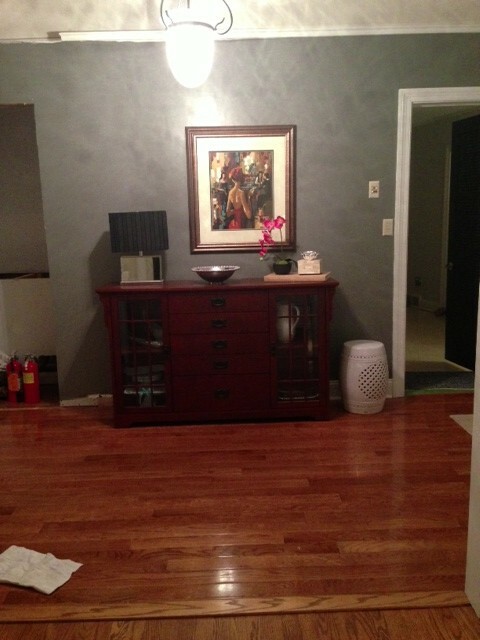 We would work in the bedroom and bathroom and completely forget there was another area that needed attention. 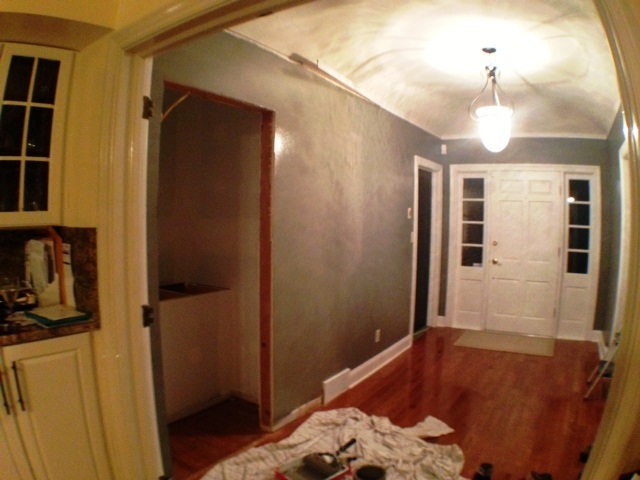 So FINALLY, we fit the foyer into our plans and I painted it to match the existing color. It feels good to finally have a sense of accomplishment in this renovation, even if we still need to add a door to the foyer coat closet, some floor trim and crown (oops!). Before the paint even dried, I immediately torn the plastic off the living room wall and moved the furniture back into the space. The sideboard and decorations all sat covered in our living room for 5 months. It felt like Christmas morning when I uncovered them! So….one thing at a time. …and now that the bedroom is nearing completion it’s time to jump start the master bathroom into gear..that space is still an open area waiting to be schluter’d (as in the Kerdi Schulter System- how we plan to lay the tile), tiled, grouted, and everything else….